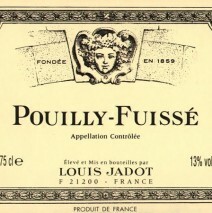 One of the true benchmark wines of the Maconnais region, the beauty of the Jadot Pouilly-Fuisse is in its precise presentation. Brilliant in the glass with an almost emerald color, it is fermented partially in steel and partially in oak, delivering a marvelous complexity of minerals, vanilla, and citrus wonderfully suited for fish or cream-sauced chicken menus. This wine is a ranking member of the old guard but it always rises to the occasion, and of course the name Louis Jadot always evokes a special comfort level. Ripe, supple and of medium body, this classic expression of Pouilly-Fuissé shows vibrant Chardonnay fruit flavors with notes of melon and minerals, gently touched with oak, ending in a fresh, silky finish.